Description: It looked like a stationary white light or orb on the edge of a chem-trail. If you zoom this photo in all the way, it looks like a grey metallic diamond shape behind a cloak of light in front of the object. I have 3 more photos of this object. 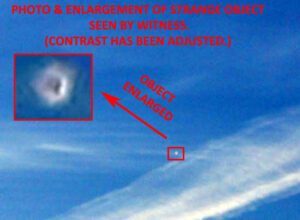 Response of Witness to Investigation Questions: Hi: Yes, I saw the object and took the photos. Did you zoom it in all the way and see what I was talking about? 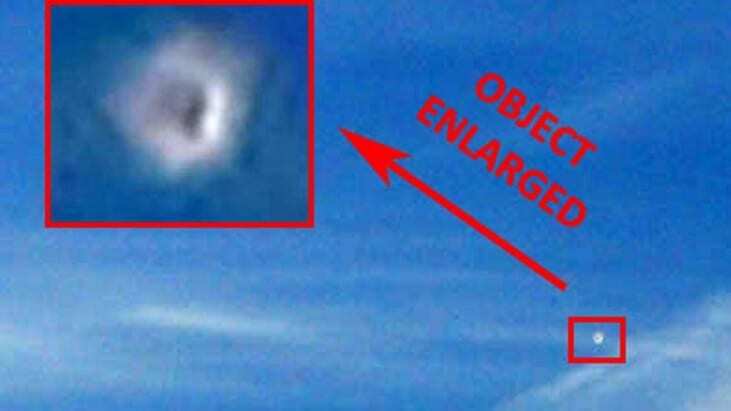 It was a grey metallic diamond shape object obscured by light or cloaked by the same color as the chem-trail clouds? You have to zoom these in all the way as well. In the first photo you can see an oblong circle around the light on the edge of the chem-trail. The 2nd photo is more obvious. Still zoom in all the way. Zoom it in until it’s just the object. It’s somewhat impressive and puzzling. 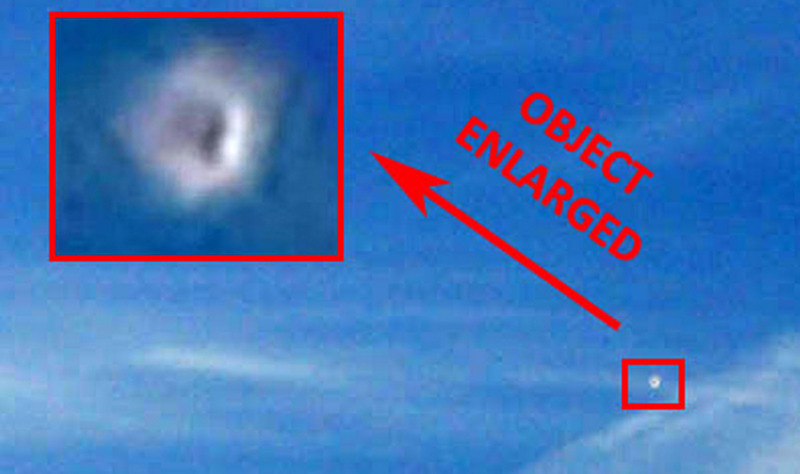 UFOs NorthWest Note: The witness took several photos of the object. He also observed the object. The photos were taken at very high resolution. The object appears to be spherical in shape until it is enlarged. Enlargement reveals a somewhat asymmetrical triangular shape. It appears that the triangular shape was surrounded by material of a light color and circular shape? The witness said that the object was of diamond shape. THE OBJECT IS NOT THE PLANET VENUS AS IT WAS NOT VISIBLE AT THE TIME OF THE PHOTO AND SIGHTING.